When a consumer looks for the absolute best weed eater they can buy, a lot of different factors have to be taken into account. First off, the workload of the trimmer needs to be defined. Is the area around the home spacious and covered in shade? If so a trimmer will likely only be needed every other week or so in the growing months. On the other hand, if the lawn is riddled with ornaments, furniture, and other obstacles that a mower can’t reach as well as exposed to a wide array of sunlight then a more heavy-duty trimmer is recommended because of the wear and tear it will endure. Some people are dedicated to a brand, almost as if they’re sponsored by them. There’s nothing wrong with that and buying popular names like Stihl or Toro can make a trip to the repair shop handy as they can bring along chainsaws or snow blowers that need maintenance made by the same manufacturer. Husqvarna is also a popular string trimmer manufacturer whose products can be found at department stores like Sears. 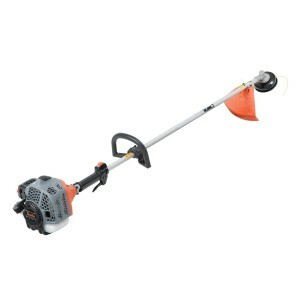 Black & Decker also makes a solid battery powered trimmer which leads to another question when purchasing – does the consumer want gas, battery, or electric powered devices. Other factors to consider when finding the best trimmer are whether the engine is 2-stroke or 4-stroke, deciding on a straight shaft or curved, and finding a weed whacker that is the perfect weight to avoid back or neck problems. Below you’ll find an interactive listing of best weed eaters. Select the various criteria you’re looking for to automatically sort and find the best option for you. Almost every consumer knows that weed eaters come in all shapes, sizes, weights, colors, and designs but the architecture falls mainly under one of three distinct categories – gas powered, corded electric, or cordless electric. Each one has their benefits, and some would say their flaws, and picking out what type of internal workings to go with on the string trimmer is probably the main decision a new weed whacker owner will make. By far the most popular string trimmers on the market, gas powered weed whackers provide more power and cut time than their competitors. Gas trimmers usually have at minimum a 21cc motor all the way up to the 32cc range. If more power than 32cc is needed perhaps a chain saw would be a better option. The type of gas that the trimmer takes is cause for much debate. Most older gas powered trimmers operate on a two-stroke engine, which requires the mixing of gas and oil together and also causes more pollution and that ‘whacking’ smell that follows the user all day long. Four-stroke engines that use the same type of gas as a riding lawnmower are becoming more popular thanks to ever-changing pollution laws. Honda and Craftsman manufacturer straight four-stroke engine trimmers while Stihl and John Deere offer a sort of hybrid device. 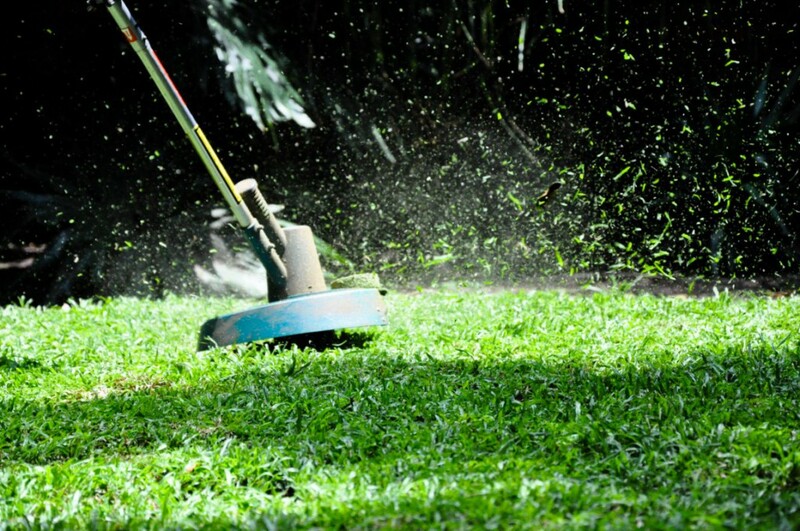 Another disadvantage that gas powered trimmers have over electric is that they are much heavier, which could wear on a person with a lawn that needs excessive weed whacking. There is a slippery slope that needs to be navigated when deciding on whether or not to buy a corded electric string trimmer. The benefits are that they are very light and can be lugged around a yard with ease, never having to stop to recharge a battery or run to the gas station to get more gas. On the other hand, they aren’t necessarily recommended for large yards because the constant hanging, tangling, and wrapping of the extension cord is enough to drive a trimmer insane. Many yards are only done about halfway even with a corded electric weed whacker because the operator gets so frustrated at the cord that they simply quit the job and head directly to their local tavern. That being said, corded electric trimmers are very economical for those with weeds growing relatively close to an outdoor outlet or those who are very patient. A yard trimming can be done in one attempt unlike a gas powered weed eater that might run out of fuel or a cordless electric whacker that needs extensive battery recharge time. Corded electric trimmers are much less expensive than their gas operated counterparts, with starting prices at around $25-30 compared to over $120. Plus the electric weed whackers don’t leave a negative impact on the environment that even low-emission four-cycle gas powered trimmers do. Cordless trimmers could be best described as the best of both worlds between a gas powered and electric weed eater. They offer the mobility and maneuverability that gas trimmers do without having to drag around multiple extension cords as one would with an electric weed wacker. Alternatively, they provide low sound just like an electric trimmer without polluting the environment or having the out-of-pocket expenses of buying gas and oil that is a necessary evil of gas operated devices. That being said, a second or even third battery is almost a necessity when purchasing cordless trimmers. All the power lies within the battery (there are no spark plugs, gas, or oil obviously) and that battery drains relatively quickly. If a house is about 1/3 of an acre or less, the cordless trimmers will perform marvelously with the standard 18V NiCad or Lithium battery. As lawns get bigger though 2 or maybe even 3 of the factory batteries will be needed and they take hours to recharge. Luckily cordless trimmers are evolving and becoming more popular with the ever-changing trend to be more environmentally conscious. Trimmers with 24V or 36V Lithium-ion batteries are more expensive, starting off around $60-80 but they’ll last a lot longer, rated for yards as big as an acre or more. A cordless trimmer is ideal for those not wanting to lift a heavy device and who have a smaller yard with minimal trimming required. There are a number of choices when it comes to string trimmers, so below we’re hand-picked the top 5 reviews based on amazon customers reviews. In the never ending quest to look for the best trimmer ever unveiled to man, the search may be over with the Husqvarna 224L. Everything about the unit suggests that this is the do-all end-all de facto number one weed whacker on the market, at least the best one made by Husqvarna. First off, the engine is a Honda four-stroke which means no more mixing gas and oil and no more worrying about breaking neighborhood pollution laws with a thick cloud of black smoke trailing a 2-cycle trimmer at all times. The engine is 25cc which offers plenty of power to trudge through those thick weeds that stood up like a cement wall to a battery operated trimmer. One aspect many people assume they have to give up as a sacrifice to power is being lightweight, as power is usually synonymous with weight. Not so much with the Husqvarna 224L which tips in at only 11 pounds, making it perfect for industrial use and around the house. The 17-inch cut diameter covers a lot of ground Husqvarna has also remedied one of the major qualms of all weed eaters, the finicky start, by using an air purge system that removes air from the carburetor and fuel system to fire up with minimal effort. There are some downfalls such as a factory defect that may keep the head from spinning directly out of the box (fixed by moving the motor down 1″ either DIY or at a repair shop). Also the $300+ starting price might be a deterrent to some people but others who have wrestled with a corded electric trimmer or a 2-cycle weed-whacker that starts when it feels like it know the value in a dependable and reliable weed whacker. Detailed review of Husqvarna 224L string trimmer. Those making their first foray into a gas trimmer after using cordless or electric devices for years will be blown away by the power of the Tanaka Inspire…in a good way. The 23cc engine performs commercial jobs adequately and efficiently and with force. Every home has that area of thick weeds that has been left unattended to for too long. They may be only a few inches high but always served as a menace to electric trimmers. The Tanaka laughs in the face of those weeds and swipes them down quickly, efficiently, and without getting tangled around the head. The 60″ solid straight shaft provides comfort for taller users as well as a durability that competitors with an ABS plastic shell simply can’t offer. The 2-stroke 23cc engine is housed on an approximately 18 pound frame which can get tiresome for long jobs. Still a simple shoulder harness attachment will alleviate some of that weight and Tanaka’s anti-vibration technologies take away a lot of that reverberation. Tanaka has also counterbalanced some of their heavy-duty added weight with convenience, such as the no-brainer quick-load head that makes loading trimmer string a simple and easy task compared to some trimmers in which more time is spent feeding the wire than knocking down weeds. Tanaka also stands by their product perhaps better than anybody in the industry, offering a 2-year commercial warranty and an unprecedented 7-year consumer warranty which more than justifies the $299 list price. Some people use their individual trimmers as somewhat of a hybrid tool, turning them sideways as an edger or running the line at full blast off the sidewalk as a blowing tool. The Black and Decker lawncare center eliminates doing a job half-heartedly for lack of tools as it features three separate tools, a string trimmer, a leaf blower, and a hedge trimmer. 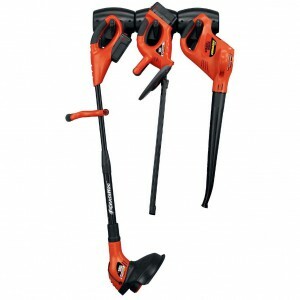 Operating on 18V batteries with a cordless design, the three piece set is everything needed to put the finishing touches on a landscape that will leave neighbors envious. Each piece in the set is lightweight and perhaps most importantly low-noise. Not everybody can trim their lawn or prune their hedges in ‘opportune’ hours and the low reverb makes yardwork an option at any time of night or early in the morning. The cordless trimmer / edger features a decent size cut path at 12 inches and the string line feeds automatically to keep the job moving. The hedge clippers are equipped with a 22-inch blade to reach those pesky bushes that have been left to grow freely all season long. Finally the blower packs enough force to clean grass, dirt, and clippings off hard surfaces such as decks, sidewalks, and garage floors. Packaged for around $200 – $250 the set offers quite a deal but it should be noted that only two batteries and a two port charger are included with the set. Because of this it may be hard to use all three tools in succession and the recharge time for batteries can be quite expansive. Detailed review of Black and Decker CCC3000. One of the main gripes about weed whacking is what an inconvenience it is. From lugging around 14-19 pounds of equipment to being unable to switch between trimming and edging quickly most people would rather just let the weeds grow instead of doing the painstaking task of trimming the yard. 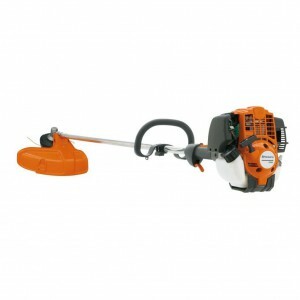 The WORX WG175 is designed to change those perceptions of trimming the yard being hard work as convenience is the name of the game with this yard tool. The first thing that’s noticeable about the WG175 is the inclusion of wheels to attach to head set. This makes edging a consistent and easy task and also enables a sort of mowing feature around tight landscaping areas. The shaft also has a telescopic quick-lever adjustment so that it is ergonomically fit for both tall and short users. The six pound frame is one of the lightest on the markets and a 32 volt lithium ion battery means more trimming power with longer periods between recharging. A common gripe about that battery is that it is somewhat hard to find. Many consumers like to have a 2nd battery on hand to keep the landscaping moving along but they’ve proven hard to find even through the WORX website. 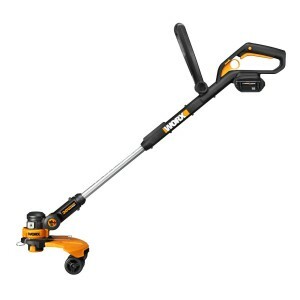 Detailed review of Worx WG175 string trimmer. 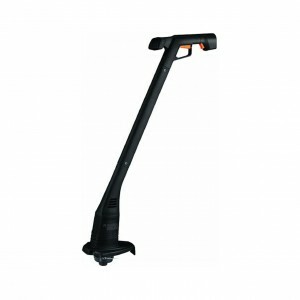 For emergency trimming jobs or just to have a backup on hand, the Black & Decker ST1000 string trimmer serves its purpose well. If a consumer has a small yard or rarely has weeds grow in the area around their home, there’s no sense spending hundreds of dollars on a device that will rarely be used. The ST1000 is probably the least expensive model on the market, listing at only around $20. This doesn’t mean that trimming with the ST1000 is akin to taking a pair of blunt scissors out to the yard as the 1.8 AMP motor holds it’s own against pesky weeds and growth. The four pound unit is very easy to maneuver around but the cord limits the overall area that can be maintained. That being said, for a $20 weed whacker the ST1000 is very reliable and packs a big punch in a small package.